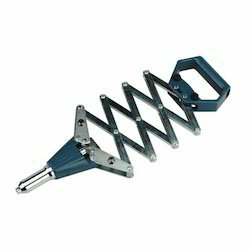 Manufacturer of a wide range of products which include lazy tong type hand riveters. Our firm offers an ideal scope of Lazy Tong Type Hand Riveters, which is perfect for tenacious and tedious use. These riveters are essentially utilized as a part of vehicle upkeep, rural, and development applications. Created utilizing lightweight aluminum bite the dust cast body, these riveters are durable and exceedingly productive.